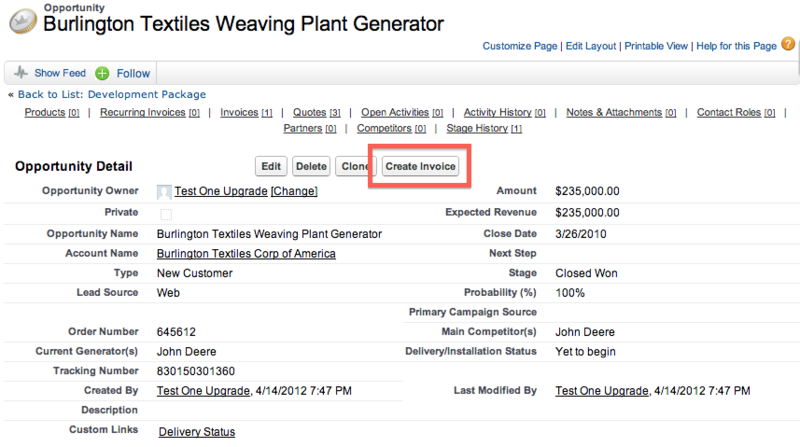 The Create Invoice button will, by default, create a one-time invoice. But what if you wanted to create a recurring invoice? A recurring invoice will be automatically created if one of the products or line items is marked as recurring. You can mark a product as recurring at the Opportunity/Quote/Order level or at the Product level. You would mark a product recurring at the Product level if all opportunities/quotes/orders created with the product will always be recurring. Use Quote Number As Invoice Number – invoice numbers are automatically generated by the app, if you are converting your quotes to invoices and want your quote number to be the same as your invoice number, you can tick this box. Clone Opportunity – if your recurring invoices are coming from opportunities, and you want to create an opportunity for every invoice that are created from the recurring invoice, tick this box. Note that the original opportunity represents the first invoice, so opportunities will only be created after the first invoice. Close Opportunity After Payment – you can check this box to automatically close opportunities after their related invoices are paid. The opportunities are closed by changing the status to Closed Won. Create Invoice On Opportunity Close Won – you can check this box to automatically create an invoice when an opportunity is closed, i.e. status changed to Closed Won. Sync If Invoice Exists – by default a new invoice is created when you click Create Invoice button, but if you want to update an already created invoice, then check this box. This means that each opportunity, quote or order will only have one invoice associated with it. Order Invoice Lines By Product Name – check this box to order invoice line items by product name when converted from an opportunity or quote.